The Corona Del Mar Hotel is a lively hotel, however is located in a quiet beach side location. The Corona Del Mar is situated just a few steps from the quieter Poniente Beach. A five minute walk will have you in Benidorms old town in 5 minutes, with its shops, bars and restaurants. This hotel really is great for Benidorm. Ok in Benidorm there are some real dives and some hotels that are for the people that want to go and just get drunk and not care about the hotel but this hotel is so far from that spectrum. The staff are brilliant, the hotel is of a good standard and the price is amazing. The food is like most of the food in Spain, not amazing but it is worth going all inclusive as it is so cheap. The rooms are big and spacious, the beds are comfortable and one thing that is very important to me is that the room has a very good iron. All in all we love this hotel and this is our third stay here while in Benidorm. 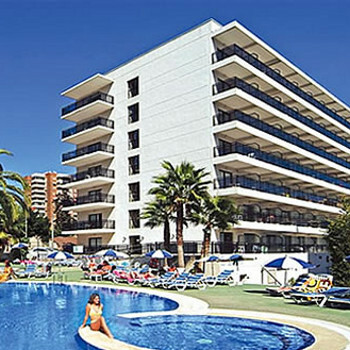 If you want to stay in Benidorm and have a good hotel to have a base from then this is for you! Our holiday in this hotel was ruined because we were burgled. There was no forced entry to the room and nothing was taken from drawers or the wardrobe. So you may ask what did they take? Answer the safety deposit box!!! They levered it off the wall and carried it out of the room in a piece of hand luggage. After this we just wanted to get home as quickly as possible. If you are reading this report perhaps you should think about what you put in the safe and although we were out for the day we took our passports, money credit cards and mobile with us. Stayed here August 07. Very clean hotel, rooms very large. All staff very friendly and helpful. Food was very good, could have a laugh with bar staff. Lots of Spanish in when were there but friendly enough, would most certainly stay here again. Hotel was very clean, beds/towels changed everyday. The bath room needed a little attention.The sealant around the bath/shower had gone black in parts. The food not great got markedly better towards the end of our week. This coincided with the head waiter returning from his holiday. Our room overlooked the cemetery. This did not put us off as it was beutifully maintained and had the advantage of being quiet at night. The hotel staff were friendly and efficient. We had many places to go at night meeting old friends so we can't comment on the entertainment. Those who stayed in told us it was very good. We found it a bind to come back for lunch and we did'nt bother somedays. For this reason we shall try half board next time. The hotel was full of old spanish people. We didnt book this hotel but direct moved us into this hotel. This hotel is good for old people and not for familys and there is only 3 beds for 4 people. we told are rep and he said that all the rooms are the same. The hotel overall is not good for a family!!!. This hotel is good and some of the staff are rude BUT some of them are ok. the food was not always hot but if you get a hot plate then it is ok. There was no entertaiment for familys JUST ball room dancing. The 3rd bed was a sofa bed. Spent 1 week in this hotel and to be honest that was enough. The hotel was spotlessly clean, in all areas, but the food was hit and miss. The starter was always pasta and soup, I bring this up because one soup appeared at every meal,(lunch & evening didn`t see one person have it, but it kept appearing). Most days only 1 choice of veg, food was cold most of the time, at least at breakfast time there was a microwave. Entertainment was at best bad, you`re better off going out. One thing we did learn it`s better for entertainment in the new town. The hotel is a very nice hotel, the food is very good, good choise with variation. Could be a little hotter. Coose a sea view room as the rear overlooks a cemetery which might upset some people. Hotel excellent could not fault in anyway. It was okay nothing special. Nice and clean though, and the food was hot.